Remember the periodic table from chemistry class in school? Researchers from Lund University in Sweden have presented fresh evidence that confirms the existence of a previously unknown chemical element. The new, super-heavy element has yet to be named. "This was a very successful experiment and is one of the most important in the field in recent years", said Dirk Rudolph, Professor at the Division of Atomic Physics at Lund University. 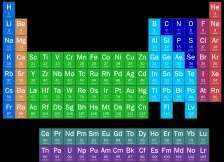 The new evidence for the chemical element with atomic number 115 will be presented in the scientific journal Physical Review Letters on August 27, 2013. Wasnt Ununpentium synthesized in 2003? Bob Lazar element! Now we can fuel our UFO's. @bearly: Same as usual, test and improve our theories of the atomic nucleus. and what about Ununpentium ? "the researchers have also gained access to data that gives them a deeper insight into the structure and properties of super-heavy atomic nuclei." So what are the properties of this element? What is its half-life? I do find it an interesting coincidence that Germany is releasing this work, when they "supposedly" attempted to make a UFO, ie the famed NAZI BELL. "All elements with an atomic number above 82 (lead) are unstable, and the "stability" (half-life of the longest-lived known isotope) of elements generally decreases with rising atomic numbers from the relatively stable uranium (92) upwards to the heaviest known element: 118. It increases in the range of elements 103 to 105, then decreases at element 106, and increases very slightly in the range of elements 110 to 114, hypothesized to be at the beginning of the island of stability." "...they are expected to have radioactive decay half-lives of at least minutes or days as compared to seconds, with some optimists expecting half-lives of millions of years..."
Sometimes it's just good to know things,,,, we would still be playing with sharpened sticks if always stopped at the point where the question "What is it good for" came up. I think in consideration of Bob Lazar touting this as a known and stable element 25 years ago makes him a good candidate for the name. I propose " Lazarium"
Now we can finally bring out all of those captured disk craft/UFO's stored in area 51, fuel them up, and fly them around!